Use the traffic signal metaphor to identify WHERE YOU ARE AND WHERE YOU WANT TO BE. GREEN LIGHT HELPS YOU GET THERE. 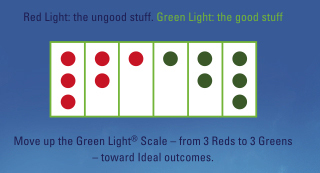 Using the Green Light Scale™ of three Red Lights to three Green ones, you can GO! from the worst case toward the Ideal Scenario. With this new awareness you can choose the Green actions that move you forward. 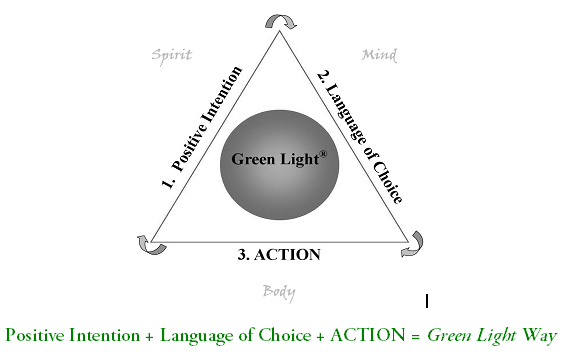 Green Light guides you to make conscious choices of specific language and actions. Cut pain, suffering and conflict. Enjoy a more fulfilling, rewarding life. Live with more fun, satisfaction and joy. Create the greatest good, in the best way, for the most people, for the longest time.